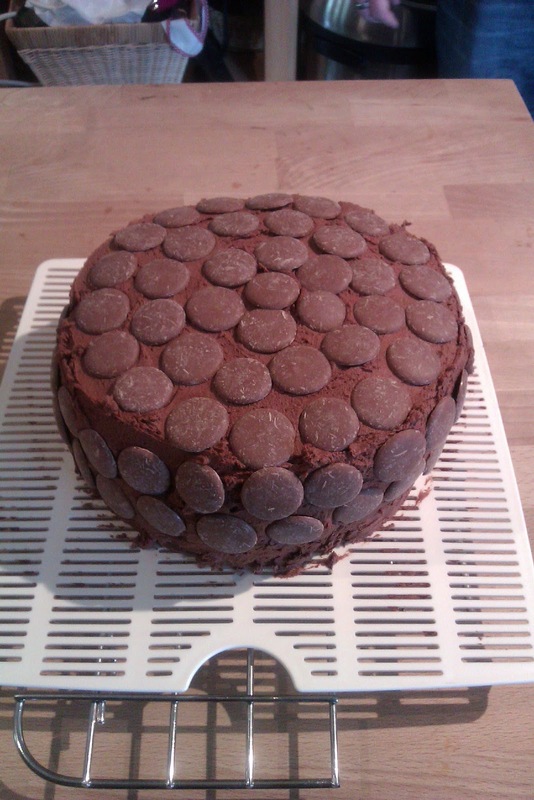 So here in all it's glory is Gem's Chocolate button cake creation that she baked for my Birthday! This recipe has been adapted to become gluten-free from the Birthday Cake recipe in Nigella Lawson's "How to Cook" book. It's very easy to make. Flour mixture: 225g total weight of gluten-free self-raising flour (I used Doves), incorporating 2 tsp gluten-free baking powder and 1 tsp xanthan gum. Preheat the oven to gas mark 4/180oc. Put the kettle on. Butter and line two 20cm sandwich tins (you can make this in a 20cm Springform cake tin but I'm not sure a gluten-free cake could withstand being cut into two). Sieve the flour, cocoa and a pinch of salt together into a large bowl. Put the sugar, butter, condensed milk, 100ml of just boiled water and chocolate broken into smaller pieces in a saucepan and heat until melted and smooth. Then, using a wooden spoon, stir this mixture robustly into the cocoa-flour mixture. When the mixture is glossily amalgamated, beat in the eggs. Split the mixture into the two sandwich tins and bake for around 20-25 mins (depending on your oven). Less is more though so the cake doesn't dry out. When it's ready, the top will feel firm. Don't expect a skewer to come out clean and don't worry about any cracking on the surface because you can hide this with the frosting. Leave to cool in the tins for 10 mins and then turn out onto a rack. Using a palate knife or spoon, spoon some of the mixture onto the top of one of the halves of cake and then sandwich the other half on top. Smooth the rest of the frosting around the top and sides of the cake. The great thing about this frosting is that you don't have to be too precise. Decorate the cake however you fancy. I used giant chocolate buttons (although this did make the cake slightly more difficult to cut so smaller buttons might be more suitable). An alternative to making the frosting is to make a chocolate ganache or icing of your choice. The frosting does add an additional layer of moisture however, which is important when baking gluten-free. It also holds the cake together very nicely.